BlackBerry today made its BlackBerry Hub+ suite of enterprise applications available to a wider range of devices. At the same time, it added five more apps to the suite. BlackBerry released Hub+ last month as a free trial for Android Marshmallow devices, but it was limited to the Hub, Calendar, and Password Keeper apps. Today, Hub+ becomes available to devices running Android 5 Lollipop and low-res Android 6 phones. Moreover, Hub+ now includes BlackBerry's Contacts, Tasks, Device Search, Notes, and Launcher apps. Hub+ is being offered to Android users for a free 30-day trial period and for 99 cents a month thereafter. For those not interested in the monthly fee, an ad-supported version of BlackBerry Hub, Calendar, Password Keeper, and Launcher will remain available. 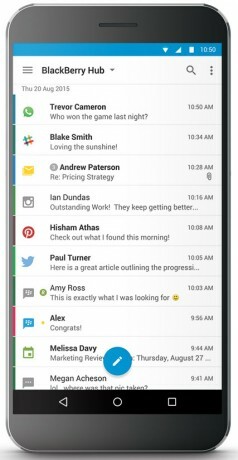 The Hub+ is the same software BlackBerry's own Priv and DTEK50 smartphones use for communications. The Hub+ provides a central place to manage email, text, IM, and social media messages. BlackBerry said it is still working to bring Hub+ to iOS.